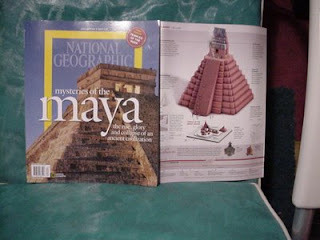 National Geographic has followed up with the article on the Maya published August 2007 (reviewed on this blog on July 18, 2007) with (a year later) a glossy “Collector’s Edition” called “Mysteries of the Maya: The Rise, Glory and Collapse of an Ancient Civilization.” The book (112 pages) is edited by Chris Johus (only his “captcha-like” signature appears on p 15). The book includes a foldout poster with detailed diagrams of the temples and monuments, and a Cinerama-style photo of “The House of the Doves.” The book is filled with large, high-quality archeological photographs and diagrams, with more pictures than text, making it rather like a “filmstrip”. I found the book at a Rite-Aid for about $10. The book is in five parts, covering the “Preclassic”, “Classic”, and “Postclassic” periods. Generally, the Maya had authoritarian monarchial structures with nobles and peasants, and developed technology in certain focused ways, leading to their achievements in tracking the motions of heavenly bodies, although it is not clear that they really could have understood astronomy as even Galileo forced us to. They did not have instant personal mobility or instant communications that mark our society and that might consume too many resources. Nevertheless, one of the main “lessons” of the book is that sustainability problems and ecological or environmental failure can doom even smaller civilizations or “city-states” while surrounding communities thrive. The “Preclassic” section, the authors describe the slashing of green wood wetlands to make charcoal to make plaster for the rich at El Mirador. As a result, in a couple generations the population could not feed itself and the area died. The pattern would be repeated elsewhere in a long and politically complicated Maya history, as the Maya often slashed their own vegetation and inadvertently destroyed their own soils. Visitors may want to check the National Geographic article from Feb. 29, 2008, “Maya May Have Caused Civilization-Ending Climate Change,” by Anne Minard, link here. National Geographic also has a generic link “Maya: Portraits of a People” here. The Maya history reminds us how we can fail, even if their collapse occurred in a relatively circumscribed area and seems to have progressed from one city-state to the next. Mayan progressive and successive ecological failures occurred in authoritarian societies with privileged and consuming upper classes. Our culture, based on democracy and mass consumption by middle classes, faces a qualitatively different challenge.